Warner Home Video has announced the full list of features that will appear on the Terminator season two DVD & Blu-ray sets. Season two will be released on September 22. See the details from the press release below. For you, over the two seasons, what storylines took on their own life, maybe in a way you didn’t expect? Friedman: I was pleased by how much we got out of Cromartie/John Henry [Garret Dillahunt]. Most of that is due to the genius that is Dillahunt—there’s a reason David Milch couldn’t leave him dead in Deadwood. I always knew we’d have a Terminator body aiding in the A.I. development, but I’ll admit it wasn’t always the Cromartie body. We explored other ideas there, but ultimately we couldn’t stand removing Cromartie from the chessboard. The ending could be looked at as an actual end to the series or as a cliffhanger. Was it difficult to come up with the finale? Why did you want to end it on such a big note? Friedman: The finale wasn’t really any more difficult than any other episode. Frankly, “Adam Raised a Cain” almost f–king killed the writers’ room, so the finale was a vacation compared to that. I’d known for quite a while where we were headed, so once we got to that point it was pretty organic. I don’t think I set out to end “on a big note,” but I knew I wanted John Henry to be attacked, and the drone seemed the most dramatic way to hit that beat. I needed to drive people to the future, and making the present an extremely dangerous place to be seemed like an important part of the equation. Do you ever see the story continuing, perhaps in a comic book or another format? Friedman: I don’t own this franchise or control it in any way. I can’t just go make a deal to do a comic book or a DVD movie or anything like that. The people that control the franchise need to be interested in another iteration of not just Terminator, which clearly they are, but TSCC, which at this point they are not. I’ve tried to pull this proverbial band-aid off as quickly as I can, but I don’t want that confused with me giving up on the show. It’s been my entire creative existence for years, and nothing strokes my ego more than hearing about people clamoring for more TSCC and e-mailing network executives to that effect. But I want people to have a realistic understanding of what’s going on. I owe them honesty. Is there anything you’d like to say to the fans? Friedman: I don’t think there’s much I could say to fans that I haven’t already said. TSCC has been my life for almost four years, and the fans have been a huge part of that experience. Nothing exists in a vacuum, and television is nothing if not a social compact—I’ll try to make something worth watching, and you’ll try to watch it. It’s a handshake, and you don’t want to leave the other guy hanging. Hopefully, we’ll try again soon. Bigger Terminator screencaps are up. Pics from individual episodes are all linked here: TERMINATOR IMAGE GALLERIES. Season two can be pre-ordered on Amazon. DVD & Blu-ray details below. Collision with the Future: Deconstructing the HUNTER KILLER Attack – Interactive exploration of the climactic Hunter Killer attack featured in the Season Two finale. 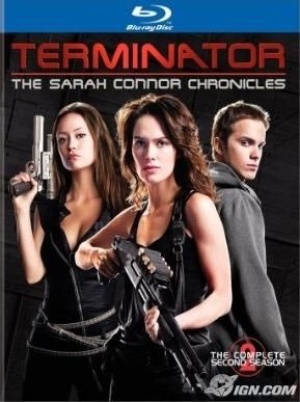 Four simultaneous points of view show all elements of the filmmaking of Terminator: The Sarah Connor Chronicles from Production, Direction, Visual Effects, and Special Effects. Additional focus points allow the viewer to explore even more elements of what it took to create this dramatic stunt sequence. Josh Friedman, Summer Glau and Shirley Manson were at Wondercon over the weekend to talk about The Sarah Connor Chronicles and io9’s Charlie Jane Anders (best T:SCC reviewer ever) has a report on what was shown in the clip reel from the last six episodes as well as some general stuff about the show, e.g. the reason why “Desert Cantos” sucked and something about the last three episodes being among the top four this season. For the full report and all the spoilers, head over to io9.com. We saw Savannah, Catherine Weaver’s daughter skipping and playing hopscotch in ominous gray tunnels, until she comes upon the mysterious room where the artificial intelligence John Henry is. “Would you like to play hide and seek?” John Henry says. Later on, Ellison is demanding to know where Savannah is, and John Henry won’t answer. John Henry asks Catherine Weaver what would happen if people knew she wasn’t Savannah’s real mother, and Catherine asks if she’s being threatened. Ellison is telling Catherine he’s sorry, and she says he should be. And then John Connor is decking Ellison and yelling that he’ll kill him. And Sarah meets Jesse, but doesn’t seem to know who she is. And Sarah meets Catherine Weaver(!). Fox has issued a release with all the March highlights, including info about episodes 2×17 – 2×20 of The Sarah Connor Chronicles. The return of Cameron’s (Summer Glau) glitch results in regrettable consequences for everyone, and Riley (Leven Rambin) fears Cameron has discovered her secret. In the first part of a game-changing two-part installment, Jesse (guest star Stephanie Jacobsen) flashes back to a life-altering mission aboard her submarine, the Jimmy Carter. Meanwhile, Sarah (Lena Headey) and John (Thomas Dekker) decide they can’t continue living in their house and make plans to leave. The exciting two-parter continues as Jesse’s submarine mission in the future takes a fatal turn that has unforeseen consequences for John, Sarah and Derek (Brian Austin Green) in the present. 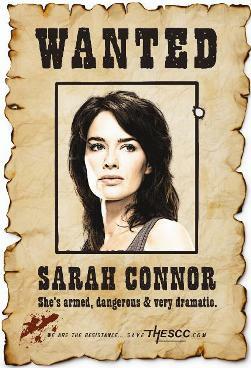 Also, Sarah deals with Cameron, who has become a liability, and John steps up and makes a life-or-death choice. Fearing for her life, Sarah stashes John in a safe house with the only person she believes she can rely on, Charley Dixon (guest star Dean Winters). Cameron and Derek struggle to work together after she reveals a big secret, and Weaver’s (Shirley Manson) entire effort is at risk when John Henry (Garret Dillahunt) is compromised – but by whom? Josh Friedman has addressed some hot topics in the Terminator fandom in a lengthy new entry on the Terminator blog: the show’s ratings in the last two weeks, the promos Fox is airing to promote T:SCC and Dollhouse, and the creative direction of the show this season. I get the sense that you want answers. You’ve got enough plant, you’re looking for payoff. I get that. And so will you. And some big things I won’t reveal. Hate spoilers. Thanks for reading, thanks for watching, thanks for caring, thanks for hating. To read the full entry, head over to the official blog.